Composer, educator, and award winning percussionist, Casey Cangelosi is a “Voice of the new generation” -Fernando Meza, 2010 International Marimba Festival. His composition style and boundary-pushing virtuosity has nicknamed Cangelosi “The Paganini of Percussion” among his peers and “a marimbist of magisterial power and insight” by the Classical Marimba League. 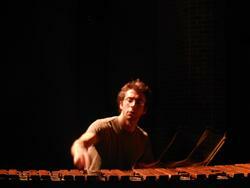 Cangelosi has performed at some of today’s most recognized festivals including the Piteå Percussion Repertoire Festival in Piteå, Sweden; the 2010 International Marimba Festival in Minneapolis, Minnesota; the 2011 Zeltsman Marimba Festival in Appleton, Wisconsin; PASIC 2011 in Indianapolis, Indiana; and the Zivkovic International Marimba and Percussion Summer Academy in Engers, Germany. In the 2011-2012 academic year alone, Cangelosi appeared as an invited guest-artist/clinician to over 30 universities, high schools, and middle schools including the University of Alaska Fairbanks, University of Texas at El Paso, Middle Tennessee State University, University of Delaware, University of North Florida, Juan Diago High School, and the Toledo Center for the Arts. Cangelosi has received numerous composition awards from the Massachusetts Percussive Arts Society, Sam Houston State University, and the Classical Marimba League. Since 2011, he has been commissioned for over 20 compositions by many performing institutions, universities, companies, ensembles, and individual soloists. Casey has won several performance awards from academic institutions as well as the Percussive Arts Society, and is a MTNA National Young Artist. Casey Cangelosi proudly endorses Innovative Percussion, Majestic, Mapex, Remo, Beiner Bags, Grover Pro Percussion, and Zildjian. Casey’s thanks go out to his loving parents, Jim and Barbara Cangelosi, his teachers at Utah State University, The Boston Conservatory, Rice University, and his amazing colleagues at Concord University where Casey is an Instructor of Music.